Abdi, a Muslim convert, has no family and he takes along a few elderly Muslims to plead for his case so he can marry Fatma. Her father has however made it known to the family that his stand is a big no, and the women know better than to argue with him; he is an adamant Swahili patriarch whose way of thinking is inspired by barazas that lobby for preservation of tamaduni za pwani, of which marriage within the Swahili setting is highly encouraged. Fatma’s grandmother knows too that to be a proper Swahili wife one has to remain or pretend to be subdued (at least in the eyes of the men), and she taps wisdom from the khanga , a long-established matriarchal baraza which is beyond the control of the men- to make her stand. As Abdi and his three wise wazee settle down to face a resolute man, the grandmother is allowed to sit in as the Fatma’s mentor and a silent witness to the extent of Mzee’s seemingly uncompromising stand. Without even saying a word, she places a khanga strategically on her knees, the message deliberately blatant for the elders to see: “Panapo mapenzi hapana uchochezi.” (Where love thrives there should be no interference). The ability of one of the wazee’s to decipher the meaning informs their case in such a manner as to employ the use of wise words which appeal to the old man, largely motivated by the grandmother’s stand that the women of the house are on their side, and thus on the side of the marriage between Fatma and Abdi. Their argument is met by murmurings of approval from the other women who are listening from an adjacent room, and one of the wazee later mentioned how the grandmother’s eyes sparkled once he used the message on the khanga to support his case. This is just one of many instances where the khanga , or rather the message it bears, has been used to push and/or alter the state of discourse and human interaction. It’s of course legendary how the same messages have been used between neighbors to trade insults which can be escalated further by bringing into the argument another element that has for quite some time been in conversation with the khanga – Ta’arab music. The power of the khanga as a communication tool further expounds on the general role of the literature in society, and specifically the role of the writer. 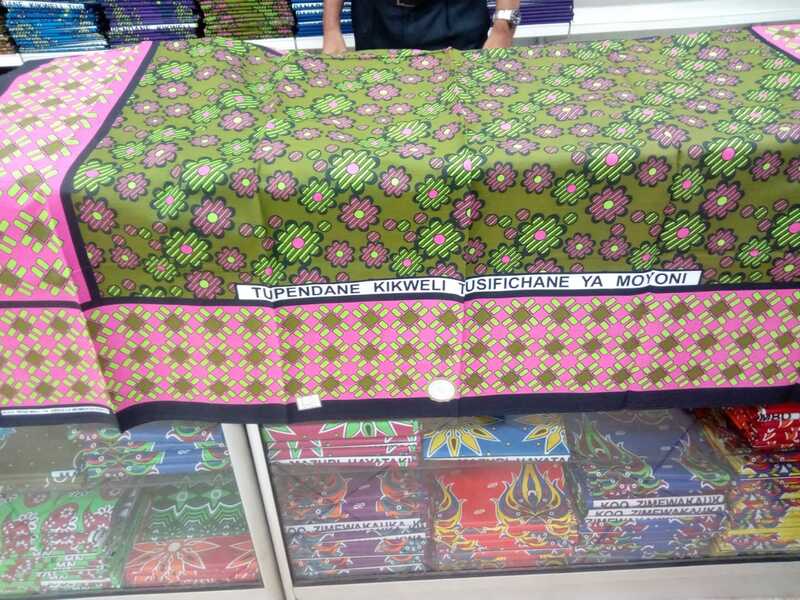 Prior to its current prominence as an object of cultural significance and prominence, the khanga was a fabric that existed in a state of loneliness. Earlier in the 20th Century when Kaderdina Hajee Essak, famously known as ‘Abdulla’ of ‘K.H.E Mali Ya Abdulla’ leso firm incorporated the use of messages on the fabric, it was perhaps at best seen as an attire working hard to divorce itself from its Portuguese roots and bud into a work of art, a fashion statement that claimed for itself a degree of coastal identity. Thus, the khanga has grown with the Swahili Nation, becoming in the process, an integral part and potent preserver of Swahili culture. Kaderdina Hajee Essak’s ingenuity catapulted a mere dotted fabric named after the Guinea Fowl into a characterful, cheerful Swahili garment resplendent in catchy messages and designs capable of engaging the society in constructive discourse and a fine appreciation of Swahili proverbs, poetry and idioms. The engagement comes from the motivation to decipher the ambiguity of these catchy Swahili sayings which can be interpreted differently across the Swahili society. The inclusion of the messages perhaps ought to be seen as some form of light that literature sheds on the vast darkness of human ignorance and to a larger extent the interrelatedness of literature and society. The literature on the khanga has since its inception addressed societal conflicts, at times speaking in hushed undertones that come from a place of sorrow and at other times more ferocious, tackling issues more bluntly and unapologetically. The khanga has become an articulate preserver of Swahili culture and literature in a consistent manner that has stood the test of changing times. Just like literature has the ability to receive appreciation across different cultures and beyond the boundaries and space from which its springs from, the khanga has done the exact same thing, traversing the Swahili boundary and finding a hearth to lay its head in other cultures as well, and just like literature, It should not be viewed or reviewed in seclusion, rather as an integral part of cultural dynamics addressed by the fabric in African settings. Even in the face of such consistency, the khanga has received competition by what Munib, Kaderdina’s grandson and director of the establishment ‘K.H.E Mali Ya Abdulla’, calls ‘populist messages’ which have ridden on the popularity of the khanga . A while back I recall running into one of such (not certain whether it was in print or just a photoshopped image) in a red and black patterned khanga which read “Ukinidiliti mwenzako ata ni downlodi” (If you delete me your colleague will download me), which can be, in this context, be interpreted as a warning from say a woman to her husband, compelling him to man up an treat her right, otherwise another man will download her! The message is problematic in itself, going beyond the limits the brand ‘Mali Ya Abdalla’ adheres to- to stay within the limits of language and morality. While the khanga has held its sway amid the numerous changes and threats of modernity, Swahili prose and poetry seems to have given up along the way. Perhaps we must, as writers within the Swahili setting, investigate where we went wrong and why there is such a big divide between contemporary and classical Swahili literature. Many, many thanks to Mr. Munib, Director of ‘Mali Ya Abdulla’ for the excellent conversations we’ve been having in regards to this topic and his availability to engage further on the same in the next installments.